What is your favorite thing to do in the whole world? 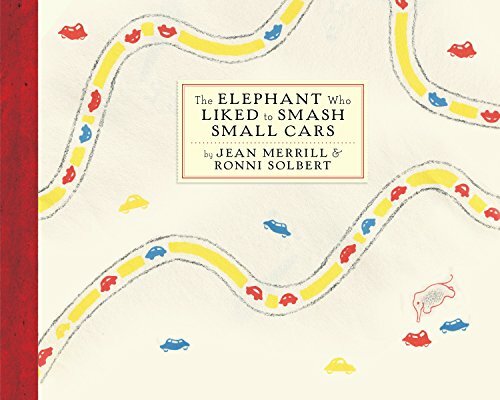 Whatever it is, odds are that you don’t like doing it as much as the elephant in this book enjoys smashing small cars. He’ll smash any small car that drives down his road. He smashes yellow cars, he smashes blue cars, he smashes red cars, all the while singing a special car-smashing song. Then one day a man comes to town and opens a small-car store right on the elephant’s road. You can probably guess what the elephant does next, but the real fun starts when the man turns the tables on the elephant—and his plan is a smashing success. Jean Merrill’s story of gleeful destruction, revenge, and conciliation is accompanied by Ronni Solbert’s colorful crayon drawings. Rarely has property damage looked so adorable. If you have any questions about this product by NYR Children's Collection, contact us by completing and submitting the form below. If you are looking for a specif part number, please include it with your message.